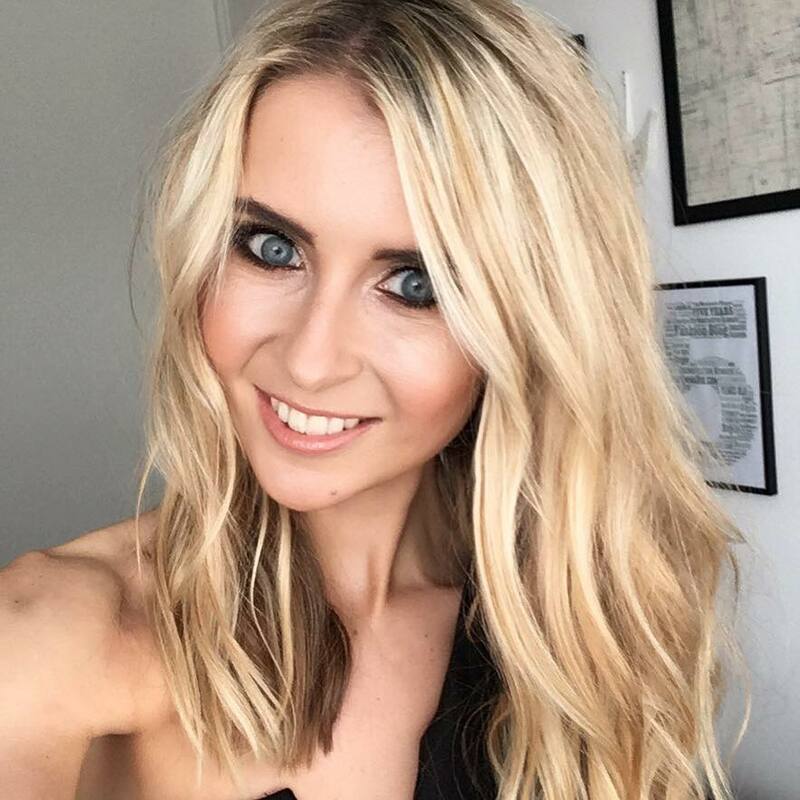 With Halloween literally on our doorstep, I decided to try out an unusual take on Halloween dining out. 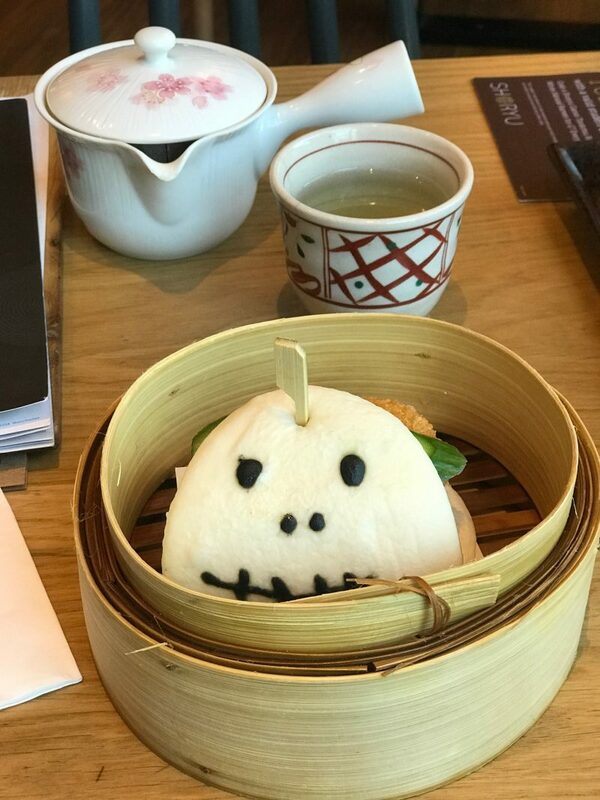 Yep, I tried a taste of Asian dining in Manchester Piccadilly Gardens, all created with a unique, spooky twist. Shoryu Ramen is hugely popular for providing authentic tonkotsu ramen from Hakata, Japan to the UK. It’s Manchester Piccadilly Gardens branch boasts a stylish, quirky Japan inspired interior, and brings in both those foodies who dote on Asian influenced food, and those who haven’t even tried it before. 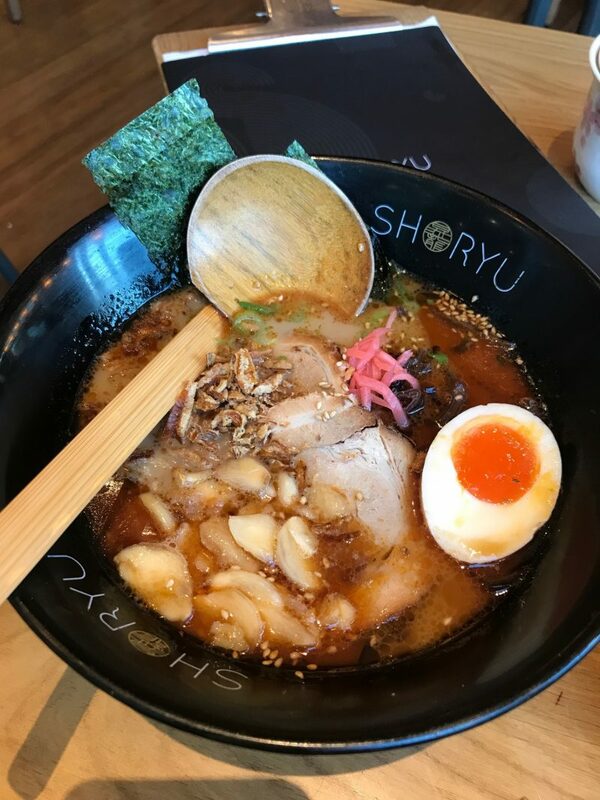 Shoryu Ramen has become a favourite across it’s UK locations for delivering traditional Japanese flavours and ramen combined with other Street Food favourites. Not only do they have an extensive array of tasty ramen in both meat and veggie creations, they also do moreish side dishes, tempura starters, fluffy buns, skewers and rice dishes just to name a few highlights. Oh, and not forgetting plum wine and exciting sake cocktails! 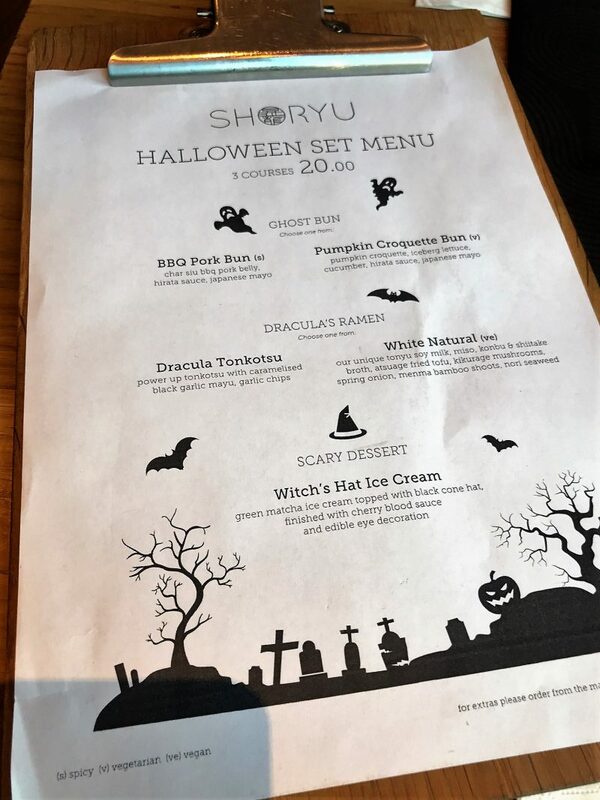 So for Halloween, I was intrigued to see what the set menu would include. 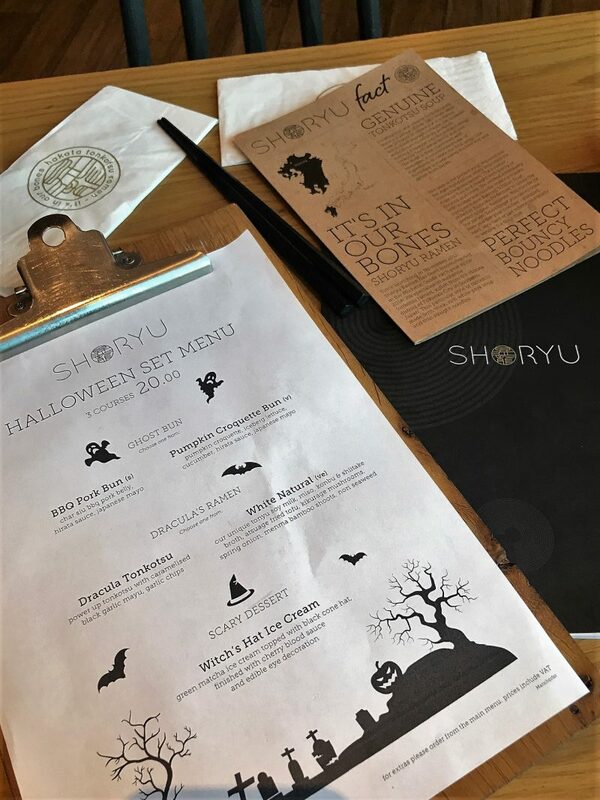 You wouldn’t usually think of Halloween and Japanese ramen cuisine in the same category, but hats off to Shoryu Ramen – the themed menu was delightful! With an offering for 3 courses for £20, you could chose from a BBQ Pork Bun or Pumpkin Croquette Bun as the starter, in which I went for the Pumpkin option. It came packed with a large breaded pumpkin slab, coated with hirata sauce and Japanese mayo, and wrapped in iceberg lettuce. All stuffed into the fluffiest, softest bun. Mmmmmmm. For the mains, the restaurant have put together the choice of either the Dracula Tonkotsu or the White Natural. The Dracular Tonkotsu features a ramen dish with sliced pork, caramelised black garlic mayu and garlic chips, where as the White Natural is more of a soya milk based miso bowl with fried tofu, mushrooms and spring onion. As Dracula is all about garlic, I decided to chose the Tonkotsu, which indeed was very garlic based, and so tasty! The noodles were just the right thickness – not too chunky but not too thin – and the ramen was rich and delicious, full of flavour, bringing out the pork. 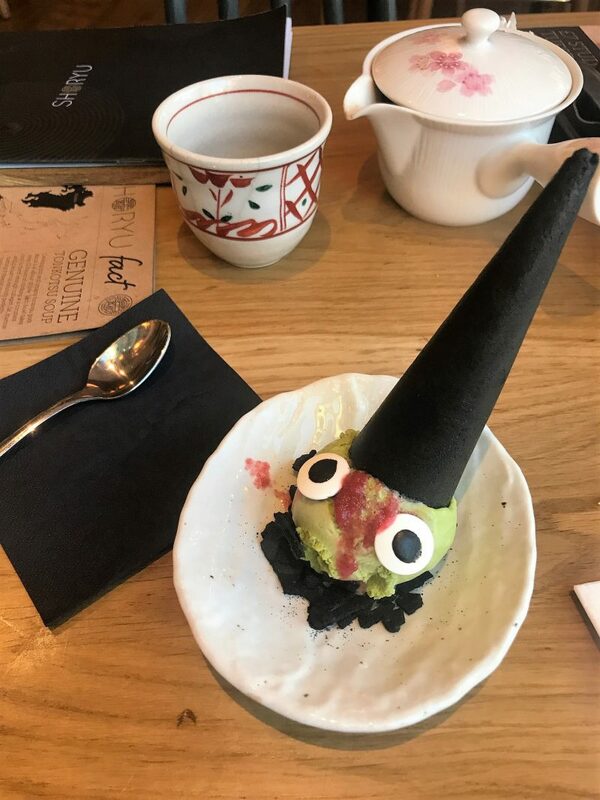 I finished off with the Witches Hat Ice Cream – a green matcha ice cream topped with a chocolate cone. 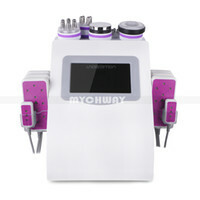 Match ice cream is sooooo yummy – so creamy without tasting too sweet. The perfect finish to the 3 courses. 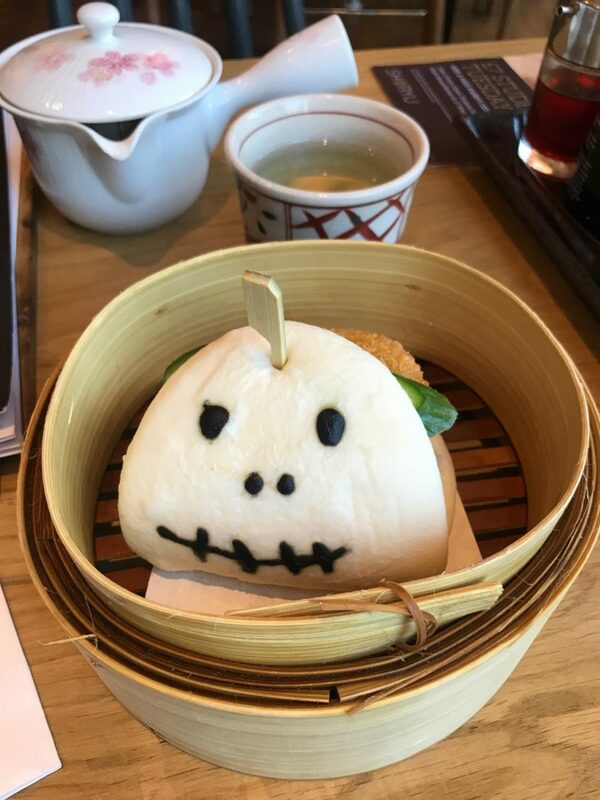 A lovely, spooky-but-cute feel to a pre Halloween lunch. Thanks Shoryu Ramen! 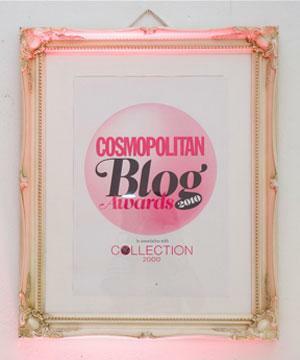 Next Post Beauty: Should You Consider Surgical or Non-Surgical Treatments?